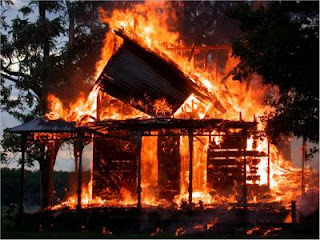 Ahmed Mai-Nama, on Thursday, torched an Upper Shari’a Court in Funtua, Katsina State, for ending his marriage. After setting fire to the building, Mai-Nama stood and watched it burn down; and allowed himself be arrested by the court's guards when they appeared at the scene. He was then handed over to the police and is being detained at the Funtua Police Area Command. An eyewitness, Shu’aibu Garba, said that two weeks ago, Mai-Nama filed a case before the court seeking it to safeguard his marriage, following incessant squabbles with his wife and her demands for a divorce. A senior court official, who did not want his name published, said that the court, after hearing from both parties, had to dissolve the union. "Unfortunately for him, the judgment favoured his wife as the marriage was dissolved by the court," he said. "When the man realised that he would not win the case, he demanded all he spent during the wedding from his wife’s family and the court granted his prayers; so he was paid all the expenses incurred." The fire raged for hours before fire fighters could mobilise to the scene, destroying the judge’s office, the chamber and the registrar’s office. Hundreds of case files, some over 40 years, were also lost to the fire. This marriage must have meant a lot to this Boko Haram man. @Yimiton, Y did his wife want out? Poor man.